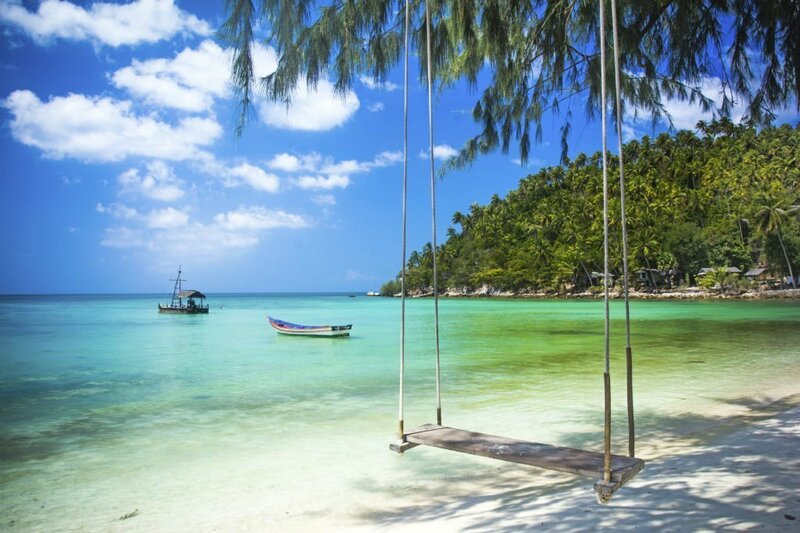 Koh Chang is one of the most famous islands of Thailand – as well as one of the largest and most picturesque. Here, travelers may find white-sand beaches, stunning views, delicious cuisine and many interesting attractions. The first thing I recommend to do upon arrival to the island is to rent a scooter as it will be pretty difficult to travel around, despite the availability of island taxis. Having a bike you will be able to explore a whole island and visit all the attractions: waterfalls, viewpoints, elephant and fishing villages, national park and many other interesting places. Beaches of Koh Chang are one of the main advantages of the island. They are not two or even three beaches, but a dozen: small and wide, wild and built-up by hotels, rocky and sandy. White Sand Beach is one of the most popular beaches – it’s famous for crystal clear sand, lush exotic trees, growing by the sea and creating a natural shadow, and numerous restaurants and cafes. In addition, in evening all venues set up tables and sunbeds at the edge of the sea and organize colorful fire shows. A separate theme to discuss is island cuisine. Bright aromas and colors of street food make you hungry in a moment: exotic fruits, seafood, barbecue made of all kinds of meat, fruit fresh and smoothies, as well as traditional dishes of rice and noodles – all of it is sold for the cheapest price. Lovers of restaurant food will find wide range of restaurants for every taste and budget – here are restaurants serving dishes of dozens of cuisines. Koh Chang is an ideal place for any type of traveler – as for a fan of outdoor activities, as well as for a lovers of beach relaxation and gastronomic tourism.